You’re Never Too Old to Straighten Your Teeth! Every day, more and more adults are making the decision to straighten their smiles. Adults not only want to improve the appearance of their teeth, they also understand the importance of an appropriate and healthy biting relationship. Dr. Kyle Raymond, one of the top dentists in Austin, Texas, believes it’s vital that our patients understand how orthodontics and occlusal (biting) relationships affect their dental health. Getting straight teeth doesn’t necessarily mean that you have to wear metal wires and brackets. With continued advancements taking place in the field of orthodontics, there are several options for our Austin patients to have the beautiful smile they’ve always wanted. When you stop by for your consultation, we’ll address all of your concerns and give you the best options available to choose from. Here are some of the types of braces in Austin you may want to consider. Traditional wire and bracket styles of braces are great for just about anyone. There’s a reason this system has been around for ages – and that’s because it works. A metal bracket is bonded on the front of your teeth and they’re connected with a wire that runs through them. This design commonly uses clear or colorful rubber bands that help nudge the teeth into position. The average treatment time is 12-24 months, depending on your oral anatomy. Overbite: This is seen when the top teeth overlap significantly with the bottom ones. In severe cases, the lower teeth may be completely covered by the top. This is also known as a deep bite. Underbite: The lower teeth overlap the top teeth. This is the reverse of an overbite. It gives the appearance that the bottom jaw is forward. Crossbite: Throughout the arch, some teeth sit in front of each other, while others sit behind. Openbite: When the back teeth are closed together, an open space in the front is visible where those teeth do not meet. Crowding: Teeth are crooked and jagged/worn, because the arch is too narrow to hold them all in alignment. Spacing: A very large space between two teeth can be challenging to close. Teeth that need to be moved vertically: Top teeth can be set high in the gums and need to be brought down, or vice versa. Excellent oral hygiene is imperative while wearing fixed braces. Orthodontic appliances tend to trap food particles, which leads to plaque buildup. If not cleaned away, these bacteria corrode the enamel surface of the teeth and cause cavities. Watching what you eat and drink will help keep your teeth healthy. It’s a good idea to stay away from sugary and acidic drinks. Also, the brackets can pop off, so avoid hard and sticky foods. 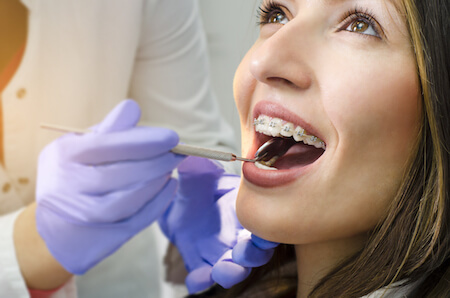 If you do need to wear conventional braces, there is good news: there’s an option available that provides the same benefits of the standard brackets and wires system, but with a more aesthetically pleasing look. The metal is swapped out for a clear or tooth-colored ceramic! With self-ligating braces, the wire passes through a small metal clip built into the bracket. This makes them more comfortable (less pressure and friction) and easier to clean. Elastic bands are no longer needed, since the clip is what holds the wires into place. Ligating systems works very well, requiring fewer office visits, and can cut down on the overall length of your treatment. Our Austin self-ligating braces are available in a both traditional or a clear/ceramic option. A lingual braces system is almost identical to conventional braces, except they’re placed on the back side of your teeth! Hidden braces are an attractive option for many adults, because being on the inside makes them invisible to everyone around you. However, there are some restrictions when it comes to lingual braces. Your teeth have to be long enough to be able to hold the custom brackets. It’s also harder to get accustomed to talking and swallowing than with traditional braces that are placed on the front of the teeth (not to mention keep them clean.) Additionally, this method can’t treat some of the complex issues that traditional braces are made for. And since it has custom made components, lingual braces tend to come with a higher price tag. Invisalign clear aligners has become the most popular choice for our adult patients looking for braces in Austin, Texas. This unique system uses the latest in technology to design a series of clear plastic aligners which gradually move your teeth without any wires or brackets. They’re worn for about two weeks, for a minimum of 22 hours a day before advancing to the next set. At the start of your treatment, several sets of aligners are made in advance. Each set is slightly different from the next, advancing the progression of tooth movement. Invisalign is a much more attractive option for adults, not just because they’re nearly invisible, but for a multiple number of reasons. They’re removable, which makes your oral hygiene routine as easy as ever. 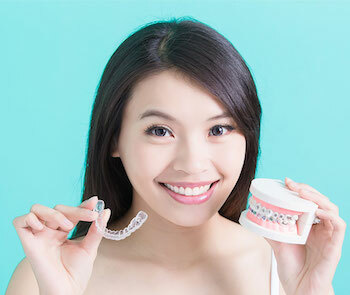 Additionally, you’ll find them more comfortable than conventional braces, because the aligners are smooth on the outside with no metal to irritate your lips, cheeks, and other soft tissues. Plus, Invisalign clear aligner systems typically have a treatment time that is usually shorter than with the brackets and wire method when you see our dentist in Austin. While clear orthodontic aligners have their benefits, not everyone will be a candidate for Invisalign treatment. You deserve to have the smile that you’ve always wanted! Together, you and Dr. Kyle Raymond, our dentist in Austin, can find an option that fits your lifestyle and goals. At Westlake we accept dental insurance and offer flexible financing options for you to choose from. Call us at 512-732-0022 today and you’ll be on your way to a new, more beautiful you!